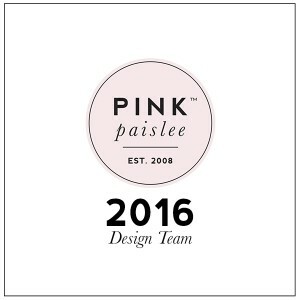 Documenting my One Little Word for 2016 with Pink Paislee. When I first saw this Notebook, the stationary addict in me just wanted to hoard it forever and never use it. You know, the stationary items that you are saving for the perfect project? Well to me this notebook was it! However, when thinking carefully about what I might like to use it for I decided that I would use it to document my 'word' and goal for 2016. So my 2016 Notebook of Goals and quotes to inspire was born. I thought very hard about what I wanted my word to be, there were a few changes I knew I wanted to make in my life for 2016. The numbers in the ephemera pack were perfect for this statement cover page. I used the chipboard letters from the collection to spell out 'I choose'. I love how well this all fit on the page of the notebook. To help the 2016 acetate pieces stand out I decided to mount it on some vellum to help it pop. My starting page for my notebook is documented by a photo of myself and a quote that inspired me to choose this word...as soon as I saw it I related to it on every level. To embellish the page I used a variety of die cut ephemera, cut apart words from one of the patterned papers and even some fussy cut flowers. I decided to put the quote directly on top of my photo - I did this using the Phonto app. I embellished the top half of this double page spread simply by adding a layer of patterned paper and attaching a 4x6 card from the acetate sheet. The layering on this page was a combination of lots of paper scraps from the collection that I had left over from creating a couple of layouts. I also used one of the 3x4 acetate cards which I placed under my journaling. I have decided that I will continue this album by adding quotes that speak to me, journaling prompted by my word and the progress etc throughout the notebook. I love that my years thoughts will be contained in the one little album. I hope my post today has given you an idea for use wth the notebook.